Made from titanium these aren’t you father’s hooks. They weigh only 3.4 grams and will hold up to 1000 pounds. They replace the whoopie bead with a hook that will “snap” on to 7/64ths amsteel. They are easy to connect, easy to disconnect but will stay on until you disconnect them. Made from titanium these aren’t you father’s hooks. They weigh only 3.4 grams and will hold up to 1000 pounds. They replace the whoopie bead with a hook that will “snap” on to 7/64ths amsteel. They are easy to connect, easy to disconnect but will stay on until you disconnect them. 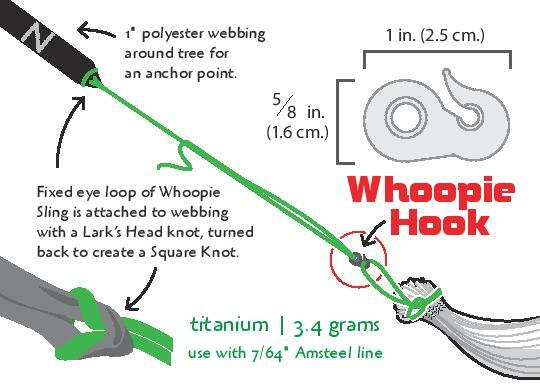 This Kit includes: 1 Pair Whoopie Hooks and 1 Pair 6 foot whoopie sling made from 7/64ths amsteel with the whoopie hook already spliced on as well as 8″ continuous loops. Dutch Clips are also available for the complete Dutchware bling set-up and if chosen will be sewn on unless otherwise specified. 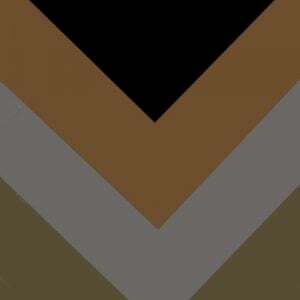 Note:– Custom Amsteel Colors available. 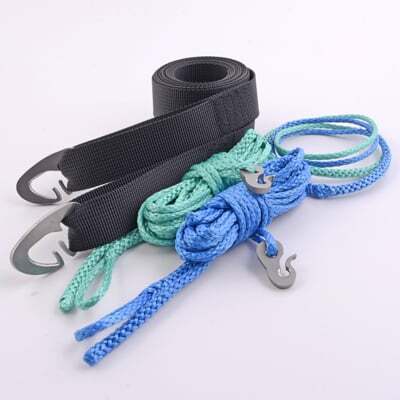 -Tree Huggers have 3″ loops sewn at both ends of webbing, are 1″ polyester and are sold in pairs. Whoopie hook suspension Decided to change from the buckle suspension that came with my Warbonnet blackbird xlc hammock. Very easy to install. I like how easy the whoopie sling suspension is to adjust. 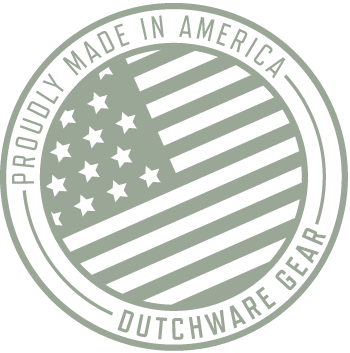 As always fast shipping from dutchware! Excellent, easy to use system.Excellent, easy to use system. Packs extremely small, and lighter than my stock Hennessy suspension. I love how adjustable it is, and no knots. One tip for Hennessy users: if you have a “new style” Hennessy with a small strap at the end (instead of two holes), get the SHORTER amsteel loops. The longer loops are more useful for the older style Hennessy with holes at the gathered end. 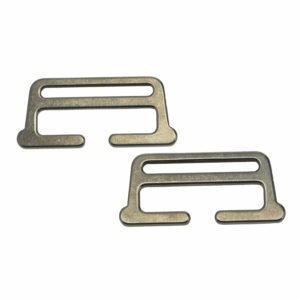 Shorter loops mean that you have a shorter minimum hang distance, which can help a little. Used these to replace the suspension on my wife’s ten foot eBay hammock.Used these to replace the suspension on my wife’s ten foot eBay hammock. 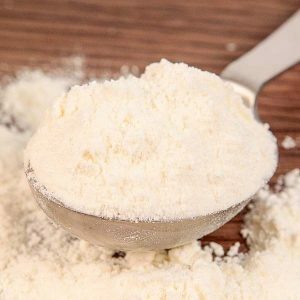 They are very easy to use and soooo much lighter than the stock! We had a issue with a tree hugger but Dutch fixed it immediately, great customer service. I’m super happy with my dutchware BLING!I’m super happy with my dutchware BLING! I’ve only had the opportunity to rig up my hammock in the back yard around 2 enormous Poplar trees, so I had to use my tree hugger straps in combination with the tree slings I got from you. Can’t use my Dutch clips until I’m on a small tree setup on the trail. The Whoopie suspension with continus loops and hooks are awesome!!! How long and how short can the whoopie slings become. Bought this to use on my Chameleon for backpacking, leaving the Beetles for moto camping. Have the same setup for my Halfwit and love the quick set up. When I first got this product in the mail it had a slight learning curve. My tree straps seemed to long and my hammock would hang to low. I then realized I just had to remove the whoopie sling from the end of the strap and move it up higher using a marlin spike hitch. Once I figured that out my hang was perfect and super easy to adjust. This suspension is small, light weight, strong, and overall very easy to use. Also I got the suspension very quickly and the customer service was great. Why is the tree hugger option limited to only 3 when you have so many different options available? They are suggestions we put with the complete package however you do not have to select them. You are more than welcome to piece together any of the options you would like to put together. Why does it matter if it is for a Hennessy Hammock? If you are replacing whats in the end of your hammock the hennessy requires a longer lead. What are pluses and minuses of longer whoopie slings and shorter tree huggers versus longer tree huggers and regular whoopie slings? The average whoopie sling is about 6′ long and that is what we sell with the complete suspension package. You normally would not have a need for a hugger that is longer than 4′ or 5′ long as when you add that to the 6′ whooping sling that should be plenty for a good hang distance. A good distance for hanging your gathered end hammock is about 13′-16′. Most times your whoopie slings will have less bulk and weigh less than your straps so you would want this to be longer than the huggers to help save a little weight and bulk. Do the Dutch clips fit securely on the spider web tree huggers? I think the Kevlar straps are wider. They are made for 1″ straps. 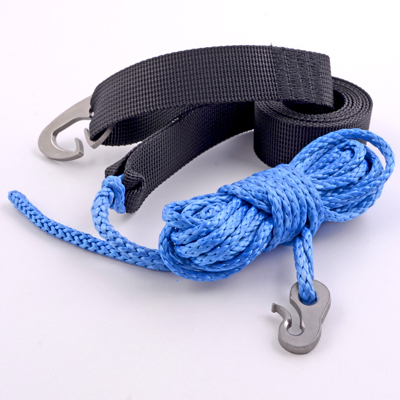 As long as you are using 1″ straps they will work nicely. I just received a set of whoopie slings along with a pair of spider web 2.0 tree huggers with sewn on Dutch clips. I can’t believe how light they are!, and as with all Dutchware gear, the quality and craftsmanship is impeccable. Thanks Dutch! Awesome for Trees or Tentsile!!! Our family enjoys camping together, and I enjoy trying to get away. We needed something with less give than nylon straps and something more quickly adjustable for under our Tentsile Stingray. The whoopie hooks are perfect for hanging our hammocks under it, so my wife and I can be close to the kids but not have our butts dragging the ground. IF IT’S QUICK, SIMPLE, EASY, WHAT’S NOT TO LIKE.. I’M RUNNING 2 OF THESE RIGHT NOW AND WILL BE ADDING AT LEAST TWO MORE TO MY STABLE THIS SUMMER.. This setup is exactly what anyone would need to suspend a hammock… unless you live in the Pacific Northwest. In that case, you’ll need longer tree straps than you can get in this package deal. Really though, the quality of Dutch’s products is awesome, and if you hang somewhere with smaller (and closer together) trees this is all you’ll ever need. Can you comment on the durability of the 2.2 vs 3.3 kevlar tree huggers? I’m pretty careful with my gear, but I see where tree bark could really do a number on thin material. They are an ultralight piece of gear but with that being said as long as they are taken care of they will last you a long time. Just received the suspension set and love it. Just received the suspension set and love it. All items included to set up my hammock in seconds. Could not be better! Just received my dynaglide whoopies with attached whoopie hooks. Just received my dynaglide whoopies with attached whoopie hooks. It’s winter, but I had to setup my hammock right away. What a revelation! At .92 oz and by far the simplest connection system ever, I am extremely happy. No more carabiners or knots. I also got a pair of 5′ kevlar tree huggers which weighed in at 1.4 oz (spot on to spec). So for 2.32 oz I have an absolutely revolutionary suspension system that could not be easier to deploy. I just asked for dynaglide in the comment section of the checkout. Ask and you shall receive. Thanks Dutch! Light, simple, quick, genius. I don’t think there is anything better. –One of the lightest systems out there without sacrificing strength or protection of trees. –Quick drying: lower water absorption versus webbing. –Fast and simple and intuitive setup and take down. 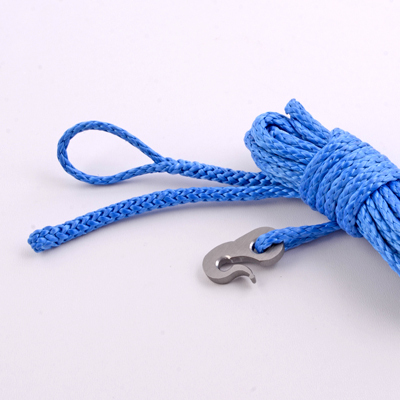 –Reliable/Safe: no knots to get wrong, no toggle or carabiner to loose. 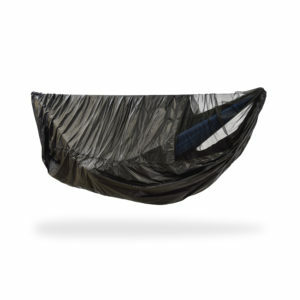 –Water break: Dutch hook provides a natural water break to prevent water running down suspension and wetting hammock. –Flexibility: Can be ordered/modified to handle two hammocks side-by-side (different whoopie hook and added spreader bar) that can then be used for either single or double applications. So ask yourself what other suspension system can do all these things. I made the switch from a webbing strap suspension to the whoopie sling with whoopie hook. I made the switch from a webbing strap suspension to the whoopie sling with whoopie hook. I was a bit leery at first, given the small diameter of the 7/64″ Amsteel cord, but it held my 250 pound weight with no problem. Ease of use, minimal materials/design were the deciding factors for me. When attached to a tree hugger strap, its easy to make adjustments to get the proper hang angle and sag. Another quality product from Dutchware. 5 star gear all the way. 5 star gear all the way. Was new to the whoopie sling and became a master in 5 mins. Those hooks are really the cherries on top of this system. Cuts my weight and eliminates the biners. Straps are excellently constructed. Super fast shipping and and great customer service. Already eyeing up my second order. bought for my girlfriends hammock, definitely a great setup! Awesome! Light, strong and a simple quick set up. My second set of whoopie slings just came in last night. My second set of whoopie slings just came in last night. Its like a little Christmas every time I see that package from Dutch. More orders will be made in the future without a doubt. If youre digging around the net for THE best suspension system for your hammock, or any other hammock camping “bling”, you found it. I wouldn’t hesitate to call this man a genius, among being just a genuine guy. 5 out of 5	Great light weight options! So, just want to point out. Dutchs has great customers service. They get back to you in a timely manner. I went with spider 1.5(12′) with the hooks sewn on. Then at the tag end had dutch sew on the toggles(so I don’t loose them(if packed wet in a pocket)). So much lighter than what I was rocking!